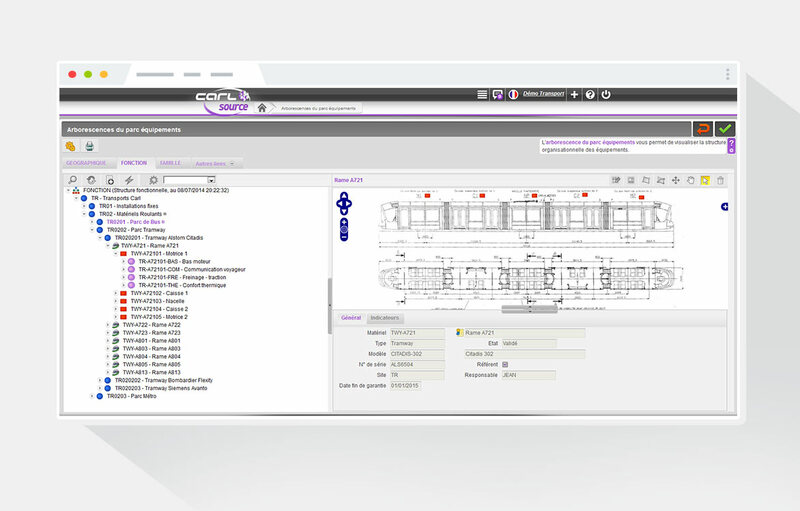 The configurable and interactive tree structures provide a true representation of your rolling stock and fixed assets and can be linked with a Geographic Information System (GIS). They make it easy to search for and navigate through information as well as group it using criteria (functional, location, technical, etc.). Structures can be changed easily with a simple drag and drop. These changes are archived and dated in the system, allowing you to see how your facilities were structured at any specific past date. A complete record is kept on each asset (light rail systems, buses, lane, signals and signs, etc.) features and specifications, warranties, multimedia documents, costs (insurance, tax stamps, taxes, etc. ), depreciation values, registration information, hardware configuration (software version, add-in boards, tyres, etc.). It also contains tracking information such as asset maintenance history, mileage, preventive and statutory maintenance schedules, standardised indicators, and more. Mimic diagrams of your various networks (electricity, video, telephony, etc.) make it easy to prepare maintenance work and allow you to assess the consequences of problems on assets that use them. CARL Source tracks readings (miles, hr, kWh, etc.) so that you can keep consumption low and set up predictive maintenance. It can be connected with your operating systems (VSCS, fuel pumps, BMS/BAS, etc.) to automatically read values on meters or information from detected alarms. The tree structure shows the spare parts list so that you can check available quantities, locate storage locations, and other important information. Each list of spare parts is updated to show the quantities of parts used to perform maintenance.